America: the land of the over nourished and home of the unhealthy. Despite big box gyms in every city, numerous fad diets, and size 0 models as the epitome of beauty, all America has to show for our skinny-obsessed society is expanding waistlines and rising medical bills. What could possibly be to blame for this dichotomy of ideality versus reality? What was once reserved for special occasions and holidays, Americans are now eating meat an alarming rate. 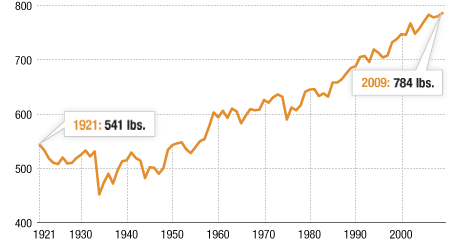 In the span of approximately 30 years, from the end of World War II to the mid 1970’s annual beef consumption per person in America doubled. To date Americans eat approximately 3 times more meat than people in other first world countries, clocking in at 200 pounds per American per year. The amount of meat consumed in the United States is unsustainable in both environmental and economic terms. 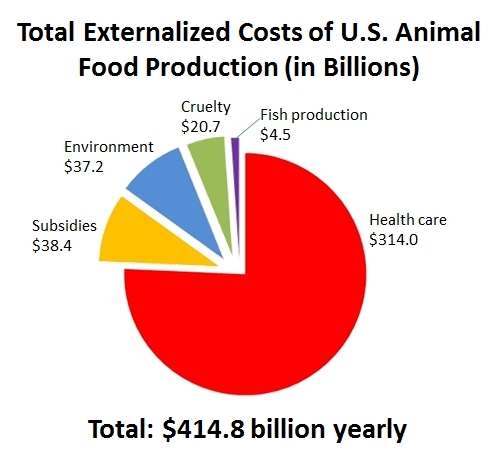 It is estimated that the total externalized costs of U.S. animal food production costs the nation $415 billion a year. Healthcare costs account for the majority of the externalized costs of animal food production (Figure 1). The trajectory of meat consumption is alarmingly predictable, as countries begin to become more modernized and incomes begin to grow, people begin to eat more meat. But is meat consumption really indicative of a successful life? Recent studies have indicated that eating a diet rich in animal products can be as detrimental to one’s health as smoking cigarettes. Animal products contain excessive amounts of cholesterol, saturated fat, refined carbohydrates, protein, and L-carnitine. L-carnitine, an amino acid, is digested by the gut bacteria and is transformed into a compound called trimethyamine-N-oxide (TMAO). Researchers have found a link between elevated TMAO levels and atherosclerosis, which is a buildup of plaque inside the arteries. Over time the plaque can harden and it narrows the artery, limiting the flow of oxygen-rich blood, which can eventually lead to a heart attack. The cholesterol and saturated fats found in animal protein have been linked to coronary heart disease-the #1 killer of both men and women in the United States, hypertension, type II diabetes, various cancers, kidney disease, osteoarthritis and obesity; all of which can be fatal if not addressed. Currently 33.4% of adults in the United States are obese and estimates are that the related medical treatment costs are approximately $200 billion a year, which is approximately 10% of the United States medical spending. In addition to the healthcare costs, obesity has been linked to decreased worker productivity and absenteeism caused by obesity-related concerns costs America approximately $4.3 billion annually. Described as an epidemic by the Centers for disease Control and Prevention, obesity is on the rise due to a sedentary lifestyle and cheap shelf-stable refined starches and grains and conventionally reared animal products. Not only are these products cheaper than the alternatives, but low-income neighborhoods often lack full-service grocery stores that have the capacity to store fresh produce or fresh meat. If these populations do have access to fruits, vegetables and organic meat and dairy, they often go unpurchased as these healthy options are substantially more expensive than processed foods. This combined with fewer opportunities for physical activities such as parks, paths and recreational centers leads to a sedentary lifestyle. This contributes to the vicious cycle that develops. Low-income families are forced to purchase cheap foods, which leads to being more susceptible to diseases due to a poor diet, resulting in billions of dollars being spent on healthcare to rectify these easily preventable diseases. The irony of the situation is that the most overnourished Americans are typically the least affluent, which is due to corn and soy subsidies creating artificially cheap processed foods. The corn used to feed conventionally raised animals is subsidized by the United States government. Subsidies were born in the late 1800s when policymakers became worried when corn yields became stagnant and were threatened by natural disasters. In order to boost food production, subsidies were implemented to encourage farmers to continue producing corn. Subsidies combined with the mechanization of conventional farming resulted an over production of corn, driving down the cost. With a surplus of cheap corn came the development of new uses for corn such as being converted into high-fructose corn syrup in processed foods or into feed for farm animals. Farmers discovered that they could fatten their cattle much quicker feeding them corn and as result many farmers moved away from feeding cattle grass and now rely on corn feed as a cow’s only nutrition. This change in diet has allowed farmers to reduce their cattle inventory while they increase their farm’s productivity. A farmer can now harvest almost 250 pounds more meat from a cow now than he could have in the early 20th century (Figure 2). This change can be attributed to the development of growth supplements and cheap corn-based feed. Unfortunately as cows are ruminants, they have neutral stomachs and consumption of corn makes their stomachs more acidic which upsets the fermentation process of the digestion system. The disruption in the digestive tract causes cows to being extremely gassy, resulting in the excessive amounts of methane released. Methane, a greenhouse gas, has been attributed to global warming as it traps solar heat and warms the earth’s atmosphere. The process of growing feed for the animals, rearing the animals, processing the meat and transportation release more greenhouse gases into the atmosphere than all forms of transportation combined. Meat production is responsible for upwards of 20% of the carbon dioxide that is released into the atmosphere each year[“>4]. One way this occurs is from clearing forests and wetlands to convert the space into feed lots and animal farms. Deforestation increases atmospheric carbon dioxide two fold. During photosynthesis plants convert carbon dioxide, water, and sunlight into glucose and oxygen. Via this process, plants and trees are able to sequester the carbon that remains from the carbon-containing carbohydrates for energy and growth. As wetlands and forests are usually cleared by controlled burning, the carbon that was previously stored in the plants and trees is released back into the atmosphere. Aside from the immediate release of CO2 into the atmosphere, deforestation also reduces the amount of future carbon sequestration that can occur. Carbon dioxide is also released with the burning of fossil fuels that is needed to power farm machinery, transport the animals and meat between processing locations, and produce the fertilizers that conventional farmers use. Fertilizer runoff accounts for 75% of nitrous oxide emissions in the United States, which is concerning as nitrous oxide traps heat in the atmosphere almost 300 times more efficiently than that of carbon dioxide. In addition to greenhouse gas emissions, nitrogen run off has been attributed as one of the main causes of dead zones in the ocean which are responsible for killing mass amounts of marine life. Cutting out meat and adopting a vegan lifestyle is not feasible for most people, but there are several habits one can easily adopt to lessen their environmental footprint when consuming animal products. The first is to reduce meat and dairy intake, either by becoming a weekday vegetarian or by adopting Meatless Monday an initiative started by Johns Hopkins School of Public Health in an effort to reduce the prevalence of preventable diseases. If Americans participated in Meatless Monday every week for one year, this would be equivalent to removing 19 million cars off of the road for an entire year, in terms of greenhouse gas emissions. Adopting the “weekday vegetarian” program would be the carbon saving equivalent of planting 43 trees per American, 13 billion trees in total. If a consumer needs to purchase meat or dairy, choosing organic and sustainably raised items as production is less environmentally detrimental and is less processed making it a healthier option. Also by purchasing locally sourced food lowers the number of miles that the food has to travel from farm to table, reducing the overall amount of greenhouse gas emissions. By becoming a more informed consumer, adoption of small habits can lead to big changes in creating a more sustainable world. ”Fast Facts: Economic Costs of Obesity.” F as in Fat. Web. 11 May 2014. <http://fasinfat.org/facts-economic-costs-of-obesity/&gt;. ”Why Low-Income and Food Insecure People Are Vulnerable to Obesity.” Food Research Action Center. Web. 08 May 2014. <http://frac.org/initiatives/hunger-and-obesity/why-are-low-income-and-food-insecure-people-vulnerable-to-obesity/&gt;. ”How Meat Contributes to Global Warming.” Scientific American Global RSS. Web. 09 May 2014. <http://www.scientificamerican.com/article/the-greenhouse-hamburger/&gt;. ”Agriculture, Energy & Climate Change.” GRACE Communications Foundation. Web. 11 May 2014. <http://www.sustainabletable.org/982/agriculture-energy-climate-change&gt;. ”Meat Production Wastes Natural Resources.” PETA. Web. <http://www.peta.org/issues/animals-used-for-food/meat-wastes-natural-resources/&gt;. ”Virtual Water.” Discover How Much WATER We EAT Everyday. Web. 05 May 2014. <http://www.angelamorelli.com/water/&gt;. “Why Everyone Should Be Vegetarian at Least One Day a Week.” HubPages. Web. 09 May 2014. <http://pi1.hubpages.com/hub/The-carbon-footprint-of-meat-consumption&gt;.